Ophidian 2360: Survival of the Fittest – An exciting surface! Today’s preview is at the head of this article, our first playmat! 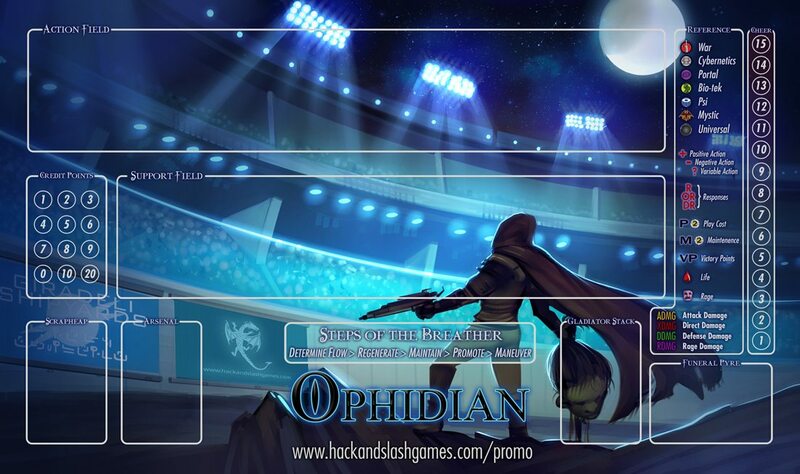 Each of our basic-level Kickstarters will include one Playmat, printed right here in the USA by our partners Inked Gaming! Wait, didn’t we promise some preview artwork today as well? Check out our Artist Page for one from Patrik Björkström… Mystical Resilience! Also, be sure to visit the Forums on BGG.com to see a new image from Jason Engle… Putrefy! Next week, buckle up for more previews!